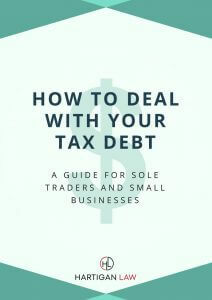 I have written this eBook for sole traders and small business owners who need help managing their tax debt. Enter your name and email address in the form below and click ‘Download free eBook‘. You will then be able to download the eBook and I will also send you an email with a copy of it. You will also be subscribed to receive other emails from Hartigan Law (but you can unsubscribe at any time).